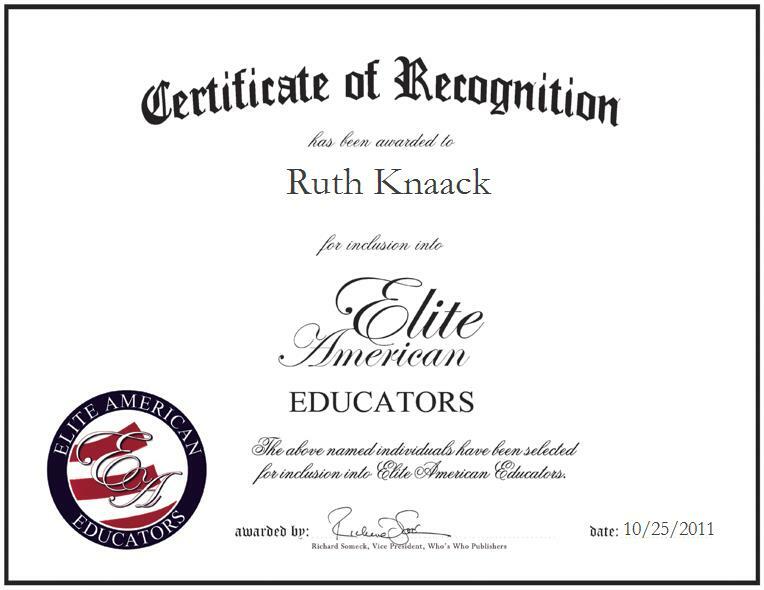 GIBBON, MN, October 25, 2011, Ruth Knaack, Principal and Teacher at St. Peter’s Lutheran School, has been recognized by Elite American Educators for dedication, achievements, and leadership in elementary education. Ms. Knaack has amassed a wealth of experience in the area of elementary education over a period of 34 years, as she has maintained a long-standing enthusiasm for teaching children and applying different strategies which help teachers to facilitate learning and overcome the challenges of reaching students on an individual basis. She designs effective disciplinary plans and supports members of the faculty by helping well-ordered students to learn and grow. Ms. Knaack attributes her success as an educator to sheer hard work. She feels that a major career highlight has been her service on an education committee for schools within her district. She earned a Bachelor’s Degree in Elementary Education from Concordia College, and she has since been able to remain abreast of trends and developments in education as a member of the Lutheran Education Association and the Minnesota Reading Association.